Tesco is understood to have postponed the consumer launch campaign for its online marketplace after failing to attract enough big-name third-party retailers. Tesco Marketplace soft-launched in April, with electronics retailer Maplin and garden plants supplier Crocus first to sign up. 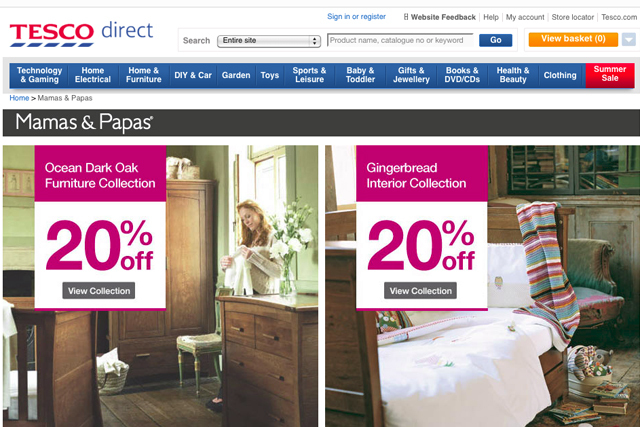 Since then, it has secured its biggest partner, baby brand Mamas & Papas, along with six smaller retailers: arts and craft business Fred Aldous, electronics and accessories retailers Purely Gadgets and Trove; online homewares supplier Wayfair; garden accessories specialist Thompson & Morgan; and Normans Musical Instruments. However, a source close to Tesco said it had shelved its planned ad campaign until later this year, when it hopes to have more big-name brands on board. Marketplace is intended to boost Tesco’s online non-food credentials, so it will be viewed as a general destination retailer, similar to Amazon. A spokeswoman for Tesco said it was ‘bringing on board exciting partners each month’ and the sellers were ‘adding thousands of products and have increased the selection of products on Tesco Direct by more than 40%’. The site currently uses the slogan ‘More choice. More points. One shop’ to highlight the expanded offer. When Mamas & Papas signed up in May, it said it was certain that Marketplace would become ‘a huge online shopping destination’. It reasoned that it could not rely on its own site reaching enough consumers, and therefore needed to ‘let the products find the customer’. Is it time for Tesco to axe 'Every little helps'?